T and P Valve replacement on water-heaters could save you alot of money. T and P Valves are the temperature and pressure relief in case the water becomes too hot or the pressure gets too high. 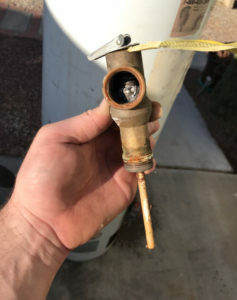 The High Desert’s water supply is full of sediment and when that build-up clogs the T and P Valve the water will leak out of the pipe coming from the water-heater. Never tamper with, or damage a water heater safety valve. The safety relief valve is important to the working function of the water heater, as well as, the safety of everyone in the home. Fortunately we offer low cost replacement of safety relief valves AT THIS PAGE. Capping or plugging the exit line on a water heater could cause an explosion. Instead, get a free estimate locally from Guaranteed Plumbing. This brass safety device is 6” to 10” long and is keeping you safe even when you don’t realize it. The thermometer inside the T&P Valve triggers the spring to release water from the tank cooling it off. The spring also allows excessive water pressure to blow out if the pressure reaches an unsafe threshold. Furthermore, hard water deposits can build up causing water to leak out of the exit pipe.